It is trained for use in war and it knows no other life. 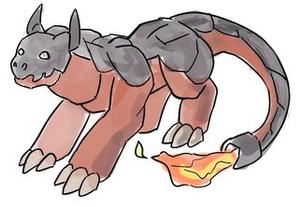 Embazook, the Gunner tuxemon, is a Fire-type, Metal-type monster. Original design by Leo. Front sprite by josepharaoh99. Other sprites by Sanglorian. Name by josepharaoh99.